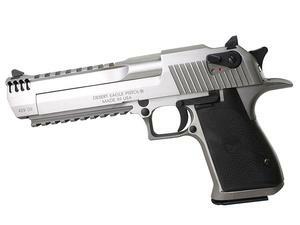 The Desert Eagle is constructed from stainless steel featuring a picatinny bottom, weaver style top rail and integral muzzle brake. Previously offered in 50 AE, 44 Mag and .357 Mag, the World Famous Desert Eagle is now being offered in the new 429 DE cartridge. Based off the popular 50AE cartridge, the 429 DE cartridge allows the use of a 44 caliber projectile in a necked down 50 AE case. The 429 DE cartridge offers 25% higher muzzle velocity compared to 44 Magnum. Polygonal Rifling w/ Right Hand Twist, 6 lands & grooves 1 turn in 18"
Weight w/ Empty Magazine 4 lbs. 7 oz.